Alcatel One Touch claimed victory in the Alice Burton Memorial Trophy 18ft Skiff race on Sydney Harbour today after previous leader Asko Appliances sailed a wrong mark on the last lap of the course. Once the Asko Appliances team realised the mistake the crew withdrew after the race, giving Alcatel One Touch the victory. Stephen Quigley, Tom Quigley and Sam Ellis were near the lead most of the day in Alcatel One Touch and the official winning margin was 1m4s. 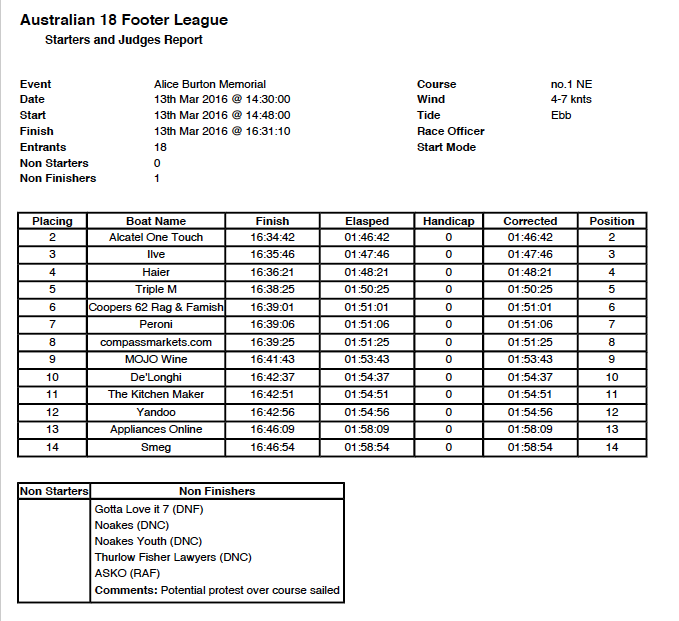 Ilve (Ollie Hartas, Mark Muirhead, Harry West) finished second, with Haier Appliances (Pedro Vozone, Tim Westwood, Lorenzo Cerretelli) a further 35 seconds back in third place. Only one minute covered the next four placings with Triple M (John Sweeny) in fourth place ahead of Coopers 62-Rag & Famish Hotel (Micah Lane), Peroni (Michael Coxon) and Compassmarkets.com (Matt Stenta). The race was sailed in a light NE wind which produced some close fleet racing over a three-buoys course. Ilve took advantage of the three-buoy system to grab the lead on the first spinnaker run. Asko Appliances (Marcus Ashley-Jones) was in second place, but challenging strongly, followed by Alcatel One Touch, Triple M and Compassmarkets.com, Haier Appliances, Peroni, Coopers 62-Rag & Famish Hotel and Mojo Wine (James Ward). 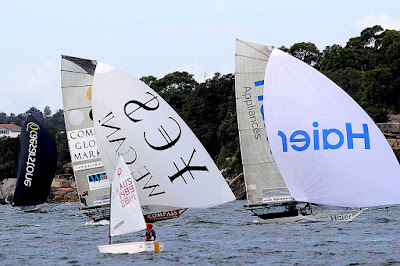 Ilve held a two boat-length lead over Asko at the bottom mark, but the Asko team was dominant on the next windward leg to open up a 20 second break over Alcatel One Touch, which had moved into second place, ahead of Ilve. Asko’s lead was only two boat lengths over Alcatel One Touch at the bottom mark on the second lap, and the pair had edged away from Ilve, which was still a clear third. Triple M and Haier Appliances were together in fourth and fifth placings. 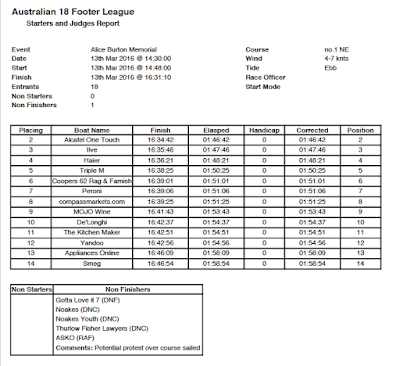 After a gap, Peroni was sixth, followed by Coopers 62-Rag & Famish Hotel and Mojo Wine. Asko Appliances crew worked the northern shore on the left hand side of the course and appeared to have a race winning lead before the crew went around the blue marker and not the white marker as required by the team’s handicap.